I recently acquired an Intel NUC (Next Unit Computing) Skull Canyon for using as portable demo and presentation lab. I will mostly run Windows 10 demo VMs and some Windows Server 2016/System Center 2016 VMs on this powerful Mini PC. I decided that I wanted to run Microsoft Hyper-V Server 2016 as the Host for my VMs, and this blog post will detail how I got it up and running. After some installation configuration choices, the setup was quickly finished. After installation and changing the Administrator account password before first time logon, the Server Core configuration was ready for to start configure the Hyper-V Server Host. Enabled Remote Desktop (All clients, less secure). This setting can be reversed after I have configured all the Remote Management scenarios I need to. Under Configure Remote Management, I also Enabled the Server to Response to Ping, that could be useful when setting up the Server. I also downloaded and installed any pending updates. 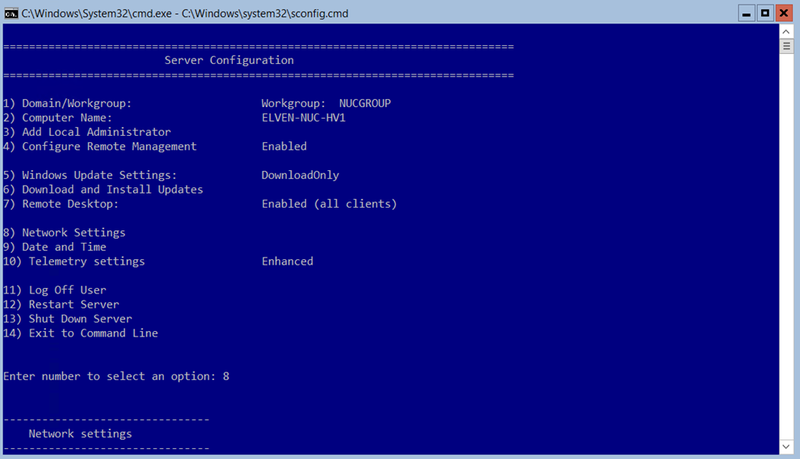 My next step was to configure the Hyper-V Host Server for Remote Management via Hyper-V Manager. 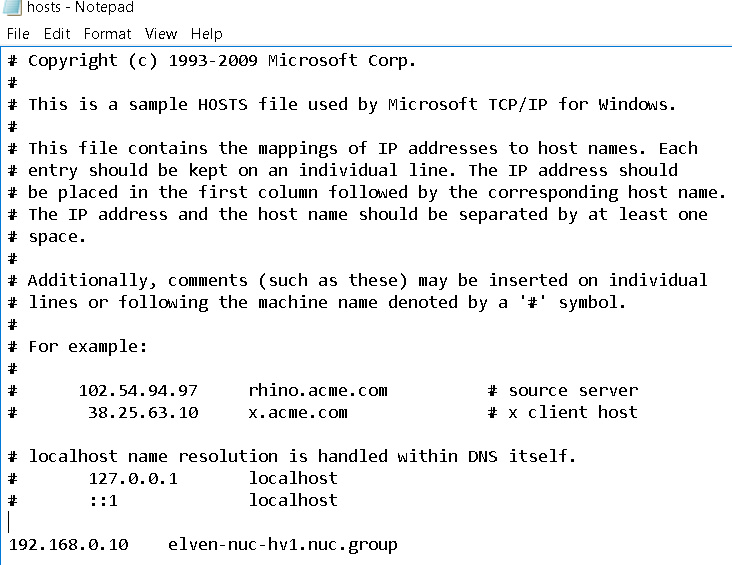 I want to use my Windows 10 machine and Hyper-V Manager to remote manage this Hyper-V Host, as described in this link: https://msdn.microsoft.com/en-us/virtualization/hyperv_on_windows/user_guide/remote_host_management. As this will be my home/portable lab, the Hyper-V Server will not be in a domain, so I need to use the instructions at the end of the above article for Manage a Hyper-V host outside your domain (or with no domain). To be able to access the Hyper-V Server from my Windows 10 client, I add the IP address (I have created a DHCP reservation for it on my Router) and the FQDN in my Hosts file in C:\Windows\System32\Drivers\Etc directory. Enable-PSRemoting will create the necessary firewall rules for private network zones. 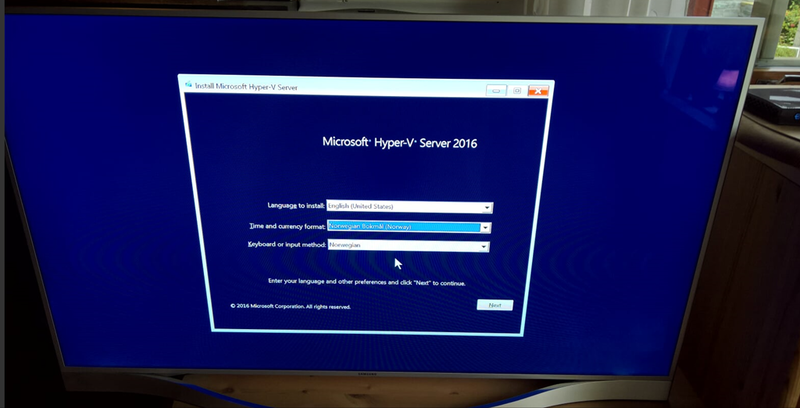 This entry was posted in Hardware, Hyper-V Server, Intel NUC, Windows Server, Windows Server 2016 and tagged Hyper-V Server, Windows Server 2016 on October 17, 2016 by Jan Vidar Elven. Thank you, great guide. I’m thinking of doing the same. A couple of questions though. Why create the FQDN? Does this gives any benefits from just using the netbios name? Is it possible to use the WIFI to connect to the network or do you need to use the Ethernet in HyperV Server? Hi Tom. The FQDN helps with authorizing the host from the client, so that if the IP address change I don’t have to change the client settings. Regarding WiFi, the answer is No. 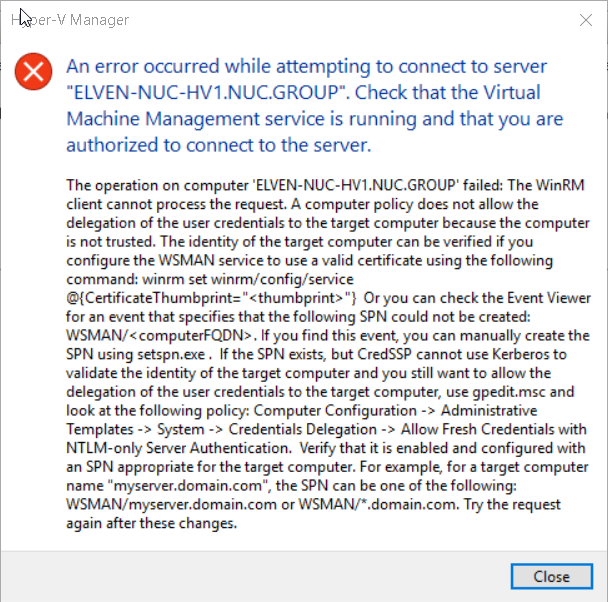 This is because it is not possible to add the Wireless LAN Service role to the Hyper-V Server 2016. To be able to support Wifi you would have to install the full Windows Server 2016 and add the Hyper-V Server Role to that. Hi Jan, thank you for the guide. Do you know if I can use a Samsung 960 EVO instead of 850 EVO. 850 EVO is a SATA based interface SSD, but 960 EVO is a NVMe based interface, and I did not find any information if Hyper-V Server 2016 supports NVMe SSD. I’m not sure, there is official support for Windows 10 and x64, so I would say probably it should work on 2016 as well. Hi, Thanks for taking the time to document this. It was a great help in connecting my win10 management client to my 2016 Hyper-V box. i have a skull canyon with 32 gb. 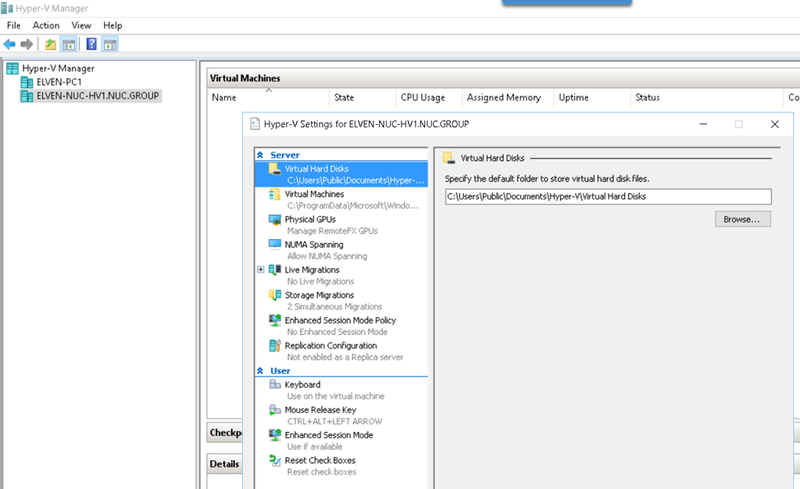 What is best to configure hyper v with virtual machines? 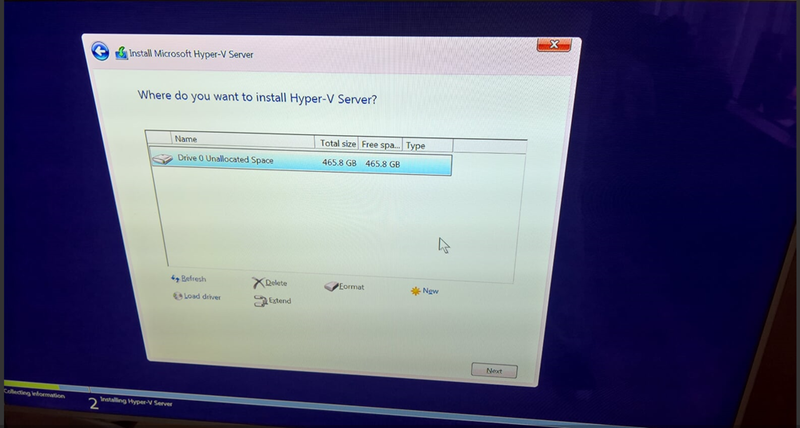 having Hyper v installed first and add VMs or install a windows 2016 server first and enable hyper V? Depends on your usage scenario, there are more features in the Windows Server 2016 with the Hyper-V Server Role, eg. GUI, Wireless Lan Service and more. I was more thinking how i can win much RAM as possible for VMs? If you want to maximize available RAM to VMs, I would install Nano Server with the Hyper-V Role. I have been testing that on my Skull Canyon, but not blogged about it yet. For a overall perspective, this is a great post https://www.petri.com/nano-server-debate-yes-no. hi, can you provide an detailed steps? Hi! Great write-up! Any idea if you can run 2016 Server on RAID 1 that’s configurable in the UEFI BIOS? Great write-up! Any idea if 2016 Server will be able to run on RAID 1, configurable in this machine’s UEFI BIOS? 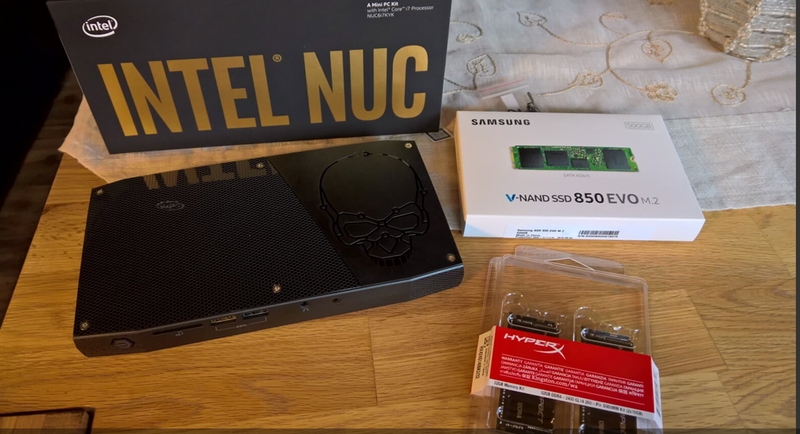 Thanks for your question, mostly I use my NUC as a demo machine for VM’s, and I find it a great choice mostly because it is small in size and easily portable when I do presentations, and have a good trade off between size and performance.